They say that the kitchen is the heart of the home. I don’t know about all that, but I do know that most people love food, and it seems as if everyone flocks toward the kitchen during parties and gatherings. It’s only fitting, then, that your kitchen be the most well put together room in your house. After all, it will likely be the focal point of most of your guests. Nevertheless, kitchen upgrades can get pricey. Countertops, appliances, flooring — it adds up quickly. Fortunately, a kitchen makeover doesn’t have to be expensive. Are you looking for some pocket-friendly kitchen renovation ideas? Look no further. Update your countertops with contact paper. Are you tired of your looking at old and stained countertops but don’t have the budget to upgrade? For an affordable and stylish kitchen upgrade, consider covering your countertops with contact paper. It’s water-resistant, easy to clean, and is available in a variety of finishes. Looking for a quick and easy kitchen makeover? Grab a can of paint and a paintbrush, and get to it. If your kitchen is too bright, paint the walls opposite windows a darker color to absorb light. If the kitchen is too dark, paint a darker color on window walls with a lighter color opposite the window wall to reflect light back into the room. Cabinets take up a good portion of the kitchen, so naturally, your eyes are drawn to them. However, investing in a new set of kitchen cabinets will typically cost you a minimum of $1,000. Looking for kitchen upgrades on a budget? Change the knobs and hinges on your cabinet. 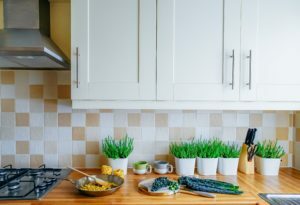 It can drastically improve the look of your kitchen and will cost you less than a fraction of the cost of new cabinets. Add a rug in front of the sink. A rug in front of your sink can help keep your feet cozy while washing dishes and add a pop of color in the kitchen. Change the rug out seasonally for a trendy look. Lighting is so much more than functional; it’s fashionable. You can greatly improve the look of your kitchen by changing out your light fixtures. You can also opt for recessed lighting if you want to make your kitchen appear larger. Change the grout on your backsplash. Bring some life back into your kitchen by adding tinted grout to your kitchen’s backsplash. Tinted grout is less prone to discoloration and staining, can add depth to washed out tiles, accentuate a tile’s shape, and adds a pop of color. If you don’t have a tile backsplash, try a peel-and-stick backsplash kit. Similar to the contact paper on countertops hack, peel-and-stick backsplash is super versatile and easy to use. Just peel and stick. No grout. No special skills. No messes. Open shelving makes your kitchen look larger because it exposes more wall space. It also allows for a lot of creativity and versatility — like using galvanized metal pipes for support and reclaimed wood for the shelves. This is probably not a good idea if your dishes consist of mismatched plastic cups from local fast food joints, but if you have a nice collection of place settings, this might be an affordable kitchen upgrade to consider. Remove the doors from some of your uppers. Many people like the idea of open shelving but are not quite ready to take the plunge and rip out their cabinets. If this is you, take a baby step in the open shelving direction and simply remove the doors from some of your upper kitchen cabinets. Doing this will give you some semblance of open shelving without having to entirely sacrifice your cabinets. Plus, it’s 100 percent free! Now that’s the ultimate kitchen upgrade. It used to be that faucets just spewed out water, but today, many kitchen faucets are like works of art. If you’re seeking pocket-friendly kitchen upgrades, a new faucet can go a long way. Plus, a new faucet will make washing dishes not seem so bad. Have you used any of these pocket-friendly kitchen upgrades? Do you have any DIY kitchen upgrades of your own? Comment below, and let us know.